This is one of the finest wigs available on the market today! This piece is 100% hand tied, meaning each strand is expertly tied into the cap, onto a transparent mesh base! Parting, wearing and styling is a total breeze, and getting it cut and styled to suit you is easy as can be... The hair is all one length so you can trim and style the piece to suit your face perfectly!! 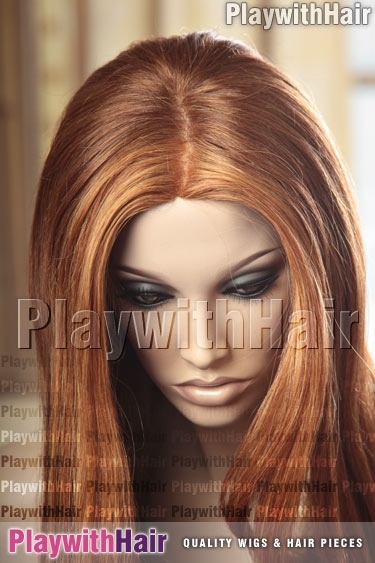 Being 25% human hair means you can style this wig so much easier, and it looks SO natural! Weighing just 5.6 ounces (159 grams), this lightweight style is so simple to style and wear! This is a top designer wig, and the quality is absolutely sensational. You wont find a better wig than this anywhere!! 2400h Vibrant Copper Red This piece is offered in color 2400H, a rich vibrant red with highlights, it's absolutely stunning and so eyecatching! !